You might have heard of Pak Choy or Bok Choy in Oyster Sauce as it is a popular Chinese vegetable dish, well for this post we will be using Kailan or what others call as Chinese broccoli. This vegetable dish is the South East Asian counterpart where it is popular within the Chinese communities in Vietnam, Malaysia and Singapore. This vegetable is thick, flat, green leaves which have that nutty stem that has the flavours similar to broccoli with a hint of bitterness. A very good side dish especially with roast chicken and pork, the nutty flavours of the vegetable goes well with the sweet and salty taste of the oyster sauce. Another simple dish to prepare which would not take much time and effort to prepare. Blanch kailan leaves together with a tsp of salt in a pot of boiling water. Once cooked to your liking (I like mine half cooked), drain and place in a plate. In a wok, heat the oil and sauté garlic until golden brown. Remove garlic from wok then set aside. In a container mix together oyster sauce, water, light soy sauce and cornstarch, place in the wok then boil until sauce thickens. Add the fried garlic and give it a mix then turn the heat off. Pour sauce in top of kailan then top with sesame oil. Such a great classic Chinese dish… delicious! this is quite comment at our Malaysian restaurants. looks so delicious the way you made it. So simple, yet so delicious. One of my favorite dishes! I get an awesome Chinese broccoli dish at a local dim sum place… so good! 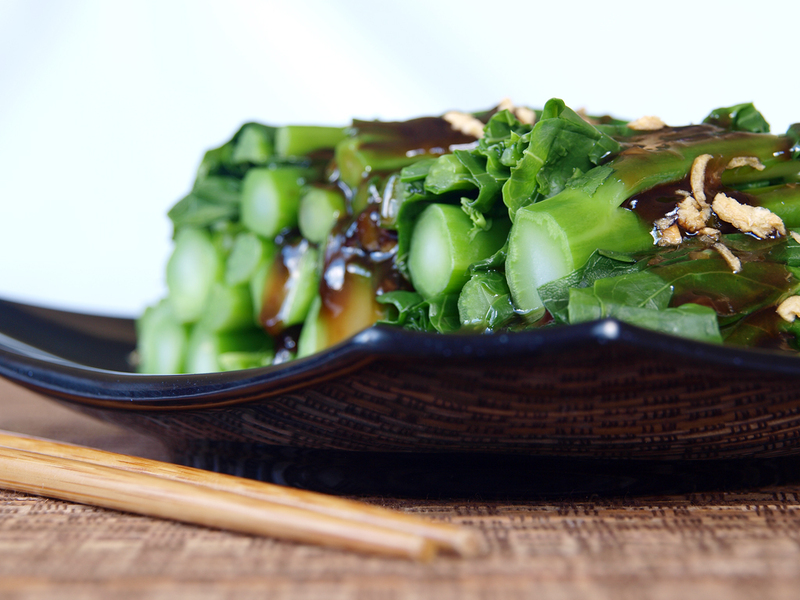 we also use kangkong for this dish.. truly a nice side dish..
Great simple dish – I love oyster sauce! Question: Is this vegetable what New Zealanders would call “Silver Beet”? It looks similar but I’m not sure.